Do you have comments enabled on your blog? Have you ever turned them off? 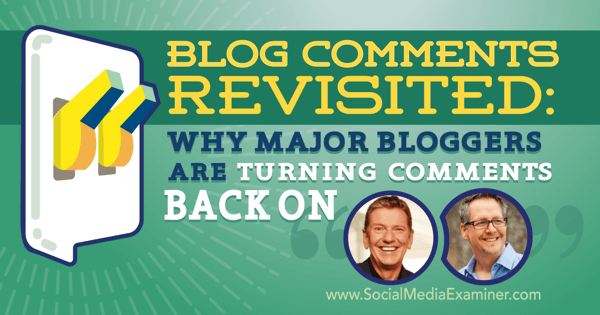 To discover why big bloggers turned their comment systems back on, I interview Michael Hyatt and Brian Clark. In this episode I interview Michael Hyatt and Brian Clark. Michael is author of Platform and co-author of the new book, Living Forward: A Proven Plan to Stop Drifting and Get the Life You Want. He’s also an avid blogger at MichaelHyatt.com and host of the This Is Your Life podcast. Brian is CEO of Rainmaker Digital, founder of Copyblogger, host of the Unemployable podcast, and evangelist for the Rainmaker Platform. Michael and Brian will explore why the initial decision to remove comments was made and why those comments are now back. You’ll also discover tips for how to grow your email list. 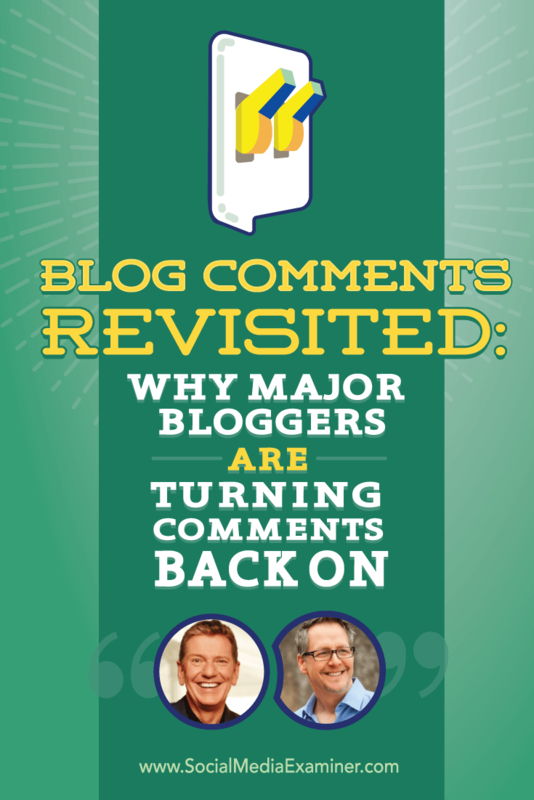 Listen as Michael Hyatt and Brian Clark share what marketers need to know about why major bloggers are bringing comments back. Brian starts by saying he is not the one who made the decision to shut down or bring back blog comments. He left that up to his editorial team. On Copyblogger, a lot of the article feedback shifted to social media, while the product development feedback had moved over to their customer base. As you mature as a company, you really start listening to your existing customers, as opposed to those “out in the wild,” Brian explains. At the time, they had 150,000 customers and their strategy was to pay more attention to them. Part of the decision to remove comments (not discussed in the post by Sonia Simone, who ultimately made the decision with input from the editorial team) was a situation Brian calls the six-month class of current commenters. When you publish a marketing blog, other marketers use commenting as a traffic strategy. You’d have six months of the same people showing up, leaving comments: some stupid, some thoughtful. Then they’d move on and a new group of people would come into the comments. 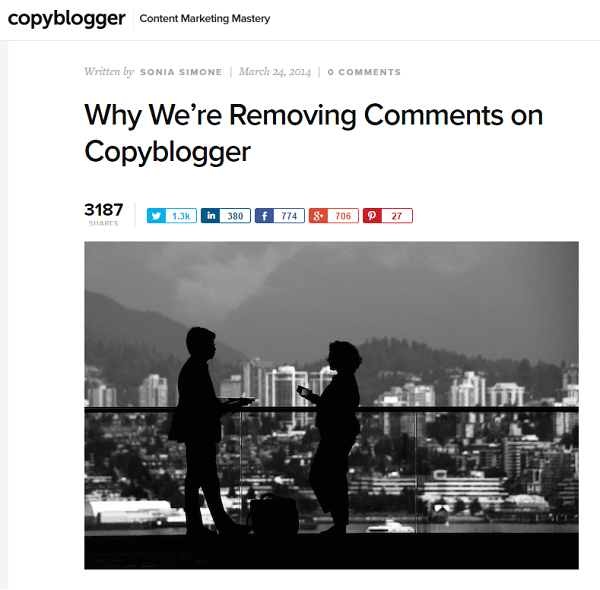 Copyblogger started removing comments in March 2014. The practical reasons for removing comments were the shift to social and to eliminate spam. It’s a big deal to moderate comments and have the editorial team spend a significant amount of time trying to figure out whether something is spam or legitimate. Copyblogger’s experiment to remove comments lasted for over a year. Listen to the show to learn why Brian left comments on their podcast network, Rainmaker.fm. Michael says his reasons for shutting down comments on his blog were similar to Brian’s. Additionally, Michael noticed the number of comments per post had been going down for some time, so he decided to do a little research. He discovered that in 2011, he averaged about 195 comments per blog post. Then in 2012, while his traffic went up, his comments dropped to an average of 179. Traffic went up again in 2013, and the average number of comments went down to 114. In 2014 blog traffic was up 74% over the previous year, but the average number of comments had dropped down to about 62 per post. As Michael’s traffic increased, the number of comments decreased. This was a major factor in his decision to shut down comments. Michael adds he read Greg McKeown’s book, Essentialism, and thought he had to pare stuff back. The final straw for Michael, who was and is using Disqus as his commenting platform, came when Disqus started injecting ads into the comment feed, with no way to turn them off. He wrote a post to share the rationale for his decision. Listen to the show to hear more about why Michael shut comments down. Comments were gone on Copyblogger for nearly two years, Brian says. He wasn’t expecting the decision to have any business impact. In fact, they added $5 million in revenue while comments were gone. They shifted to Google+ for community engagement and to hear what people thought. Some people got it, some people understood but didn’t like it, and there was a very vocal group of people who took the opportunity to bring attention to themselves by saying Copyblogger was ruining everything and was doomed as a business. Brian says the same thing happened when they shut down their Facebook page. While they weren’t worried about their business, Brian couldn’t help but wonder if they were losing something intangible by not having comments on blog posts. Their answer at the time was no. After they shut down comments on Copyblogger, people went to Google+ to comment. Michael says some (not many) people were upset when he shut down comments and there were people with honest questions about it. The biggest reaction Michael saw was confusion. People didn’t know what to do. They wanted to be engaged, but had no outlet for it. Some people tried to post on Facebook, Twitter, or LinkedIn. Yet, there was no place with a central focus. Michael says he really believes what Stu McLaren says: People come for content, but they stay for community. Once comments were removed, Michael had to go to multiple social networks, including Facebook, to engage with his community. 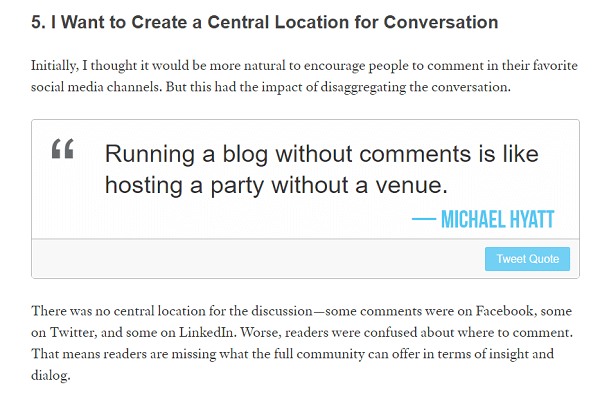 Michael discovered managing multiple social networks was actually worse than trying to manage the comments on his blog, because he then had to go to three or four different places to try to be responsive to the conversation. He likes being engaged with and learning from the people in his community, but couldn’t do it very well with the conversations dispersed over multiple platforms. Listen to the show to hear my reaction as a community member to comments being shut off on Copyblogger. In January 2016, about a year after turning off comments, Michael reversed the decision and wrote “Why I’ve Brought Comments Back.” He discovered that 2015 was the first year since he started blogging in 2004 that his blog traffic had not grown. Michael doesn’t think not having comments was the only driver behind the drop, but it definitely had an impact. He’d also reduced the number of posts he published to two per week. Michael brought comments back and started publishing three posts a week. Once comments returned, many people told him they just stopped dropping by the blog, because it didn’t feel hospitable. It felt cold, sterile, and uninviting. Since comments have been back, traffic is growing again, and is up 20% over the same period last year. Michael says comments have created some vitality on the blog and it feels like somebody is home. Although Michael’s company is bigger now (he has 15 full-time people), he still responds to the comments. His audience still writes comments on their social networks, but those are more about what’s posted there, and not what’s on the blog. He adds that Disqus now allows you to turn off the ads they were injecting, and seems to have much better spam control. Michael brought back comments on his blog for many reasons. Brian explains Copyblogger brought comments back in January (coinciding with the website’s redesign) for reasons similar to Michael’s: to be more welcoming. He could not trace comments to any of the business metrics that mattered. Their traffic plateaued as well, but they were converting many people from a new email approach, and that’s what really mattered to them. He says that when Pamela Wilson (who’s now in charge of Copyblogger) came on board full time, she told Brian that as a writer, she missed the comments, interaction, and feedback. Brian gave the okay to turn comments back on. His only qualification was that she had to explain to the readers why comments were coming back, and she did. Editorial now has to deal with comment moderation, but they only leave the comments open for seven days, which has helped reduce spam. (They discovered a lot of the spam was coming in on older posts.) Copyblogger’s audience is also happy to have the comments back. 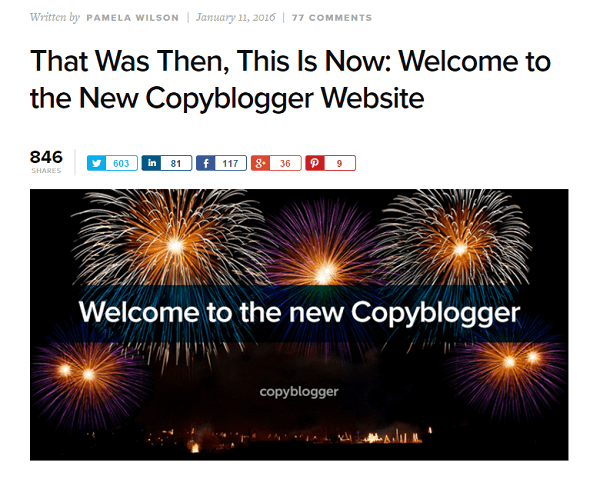 Copyblogger brought back comments along with their redesigned website. Michael shares that he received 485 comments on the post announcing his decision to bring comments back. He says that people responded positively, but also told him things he wishes he’d heard after he shut it down. He explains that the comments on that post are a whole study of why he shouldn’t have pulled comments in the first place. Listen to the show to learn what Brian thinks are some of the cues that inspire someone to read a blog post. Brian says in 2013, they shifted from a newsletter opt-in (subscribe) approach to an access and registration approach. They repurposed some of their evergreen content on cornerstone topics into ebooks, and built a content library that’s basically a free membership area. There is a MarketingSherpa case study on their change in approach, because their opt-in rate went up 400%. They have evolved from there, Brian adds, and even launched the Rainmaker platform using a podcast they turned into an audio course. Brian says they are finding that, “whether you call them lead magnets or ethical bribes,” the game has been upped, especially in a competitive field like content marketing. In short, that’s the way the web works. If you want anything good online, whether it’s Gmail, Facebook, Twitter, or a freemium app, you have to register to get access. Brian explains how he’s using the same approach for his personal project Unemployable. 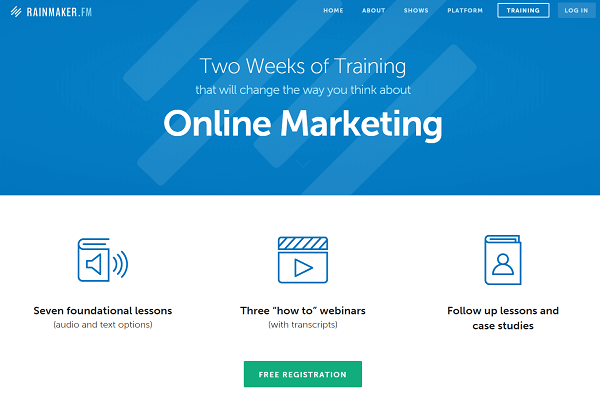 People who sign up for the Rainmaker email also get a free course. Michael says they grew their email list 120% last year. They created some incredible lead magnets that had enormous value. For example, Michael explains, one of their most successful campaigns was in December in conjunction with his 5 Days to Your Best Year Ever product launch. They created a LifeScore Assessment, which enabled people to score themselves in the 10 domains of life and come up with one score that represented how they were doing in life. They got 40,000 opt-ins on that one little tool. They got the word out via different kinds of Facebook ads. They uploaded a segment of their email list and did lookalike audiences. Plus, affiliates emailed their audiences. Another successful opt-in was sourced from 20 high-profile personal-development experts. Michael explains how they reached out and asked how they set themselves up for their best year ever. Everyone submitted about a paragraph, and the material was summarized and put it into eight points in a PDF. That one got about 80,000 opt-ins. Michael explains how the LifeScore Assessment was part of a lead funnel that led to the sale of a product. The LifeScore Assessment was a very successful lead magnet for Michael Hyatt’s Best Year Ever course. They had 40,331 opt-ins, sold 1,890 copies of the Best Year Ever course for a total of $437,000, and bought about $42,000 worth of Facebook ads to generate that. This was tracking the people who opted into the LifeScore Assessment. When people opt into Michael’s emails, they’re told that they’re getting the newsletter and his blog posts. Once people opt in, they’re quarantined for about 30 days, which means they’re not promoted to. Michael wants to nurture them, so there’s a sequence that goes with their best content over the course of that 30 days. Yet during that time, they don’t promote anything else. When they come out of quarantine, Michael feels they have the relationship and have built the trust and can start selling. Michael believes you have to add value before trying to extract value. Brian agrees. He says that’s the whole idea behind content marketing. It’s know, like, and trust. Then offer. Listen to the show to hear about Michael and Brian’s latest projects. Anchor.fm is a social network that lets you instantly broadcast bit-sized audio clips to the world as well as react to them in the app. 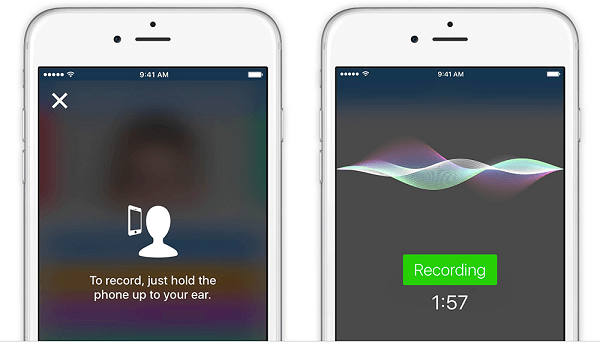 Using your phone, you can record 2-minute audio clips and talk about anything: ask questions, make a statement, and so on. Then you can tag people in the post and/or write a description, and post it on Anchor. After that, you can tweet it, share to Facebook, or embed the audio files (called waves) into blog posts. And because Anchor is integrated with Twitter, it’s easy to find friends and search contacts on your phone. Anchor.fm is an audio social network. You don’t need to be on the app to listen to someone’s wave audio file, but it helps. After you listen to a wave on your phone, you can hit the Reply button and then you have a minute to respond to the original audio or to anyone who has replied in the thread. For example, Podcast Answer Man Cliff Ravenscraft did an “Ask Me Anything” using Anchor and had people send him one-minute questions. Anchor is currently iOS only, but they are heavily into development on the Android app. Listen to the show to learn more and let us know how Anchor works for you. Chris Ducker from ChrisDucker.com will be showing how to launch a brand-new product or service using the power of Periscope. 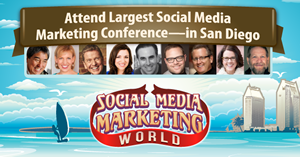 It will be “value bomb” after “value bomb.” If you can’t make it out to the conference, we do have a virtual ticket. With the virtual ticket, you will get access to Chris Ducker’s session and every other session and workshop throughout the conference. The networking is going to be off the hook. We have our opening-night party on an aircraft carrier, the USS Midway. If you are at the conference, please come up to me to say hi. Click here to check out the speakers and the agenda. Learn more about Michael on MichaelHyatt.com. Read Platform and Living Forward: A Proven Plan to Stop Drifting and Get the Life You Want. Find out more about Living Forward. Listen to the This Is Your Life podcast. Learn more about Brian on Copyblogger, Rainmaker Digital, and the Rainmaker Platform. Listen to the Unemployable podcast. Explore the Digital Commerce Institute and access some of the content. Listen to my episode with Mark Schaefer and Tim McDonald, talking about big blogs shutting down their comments. 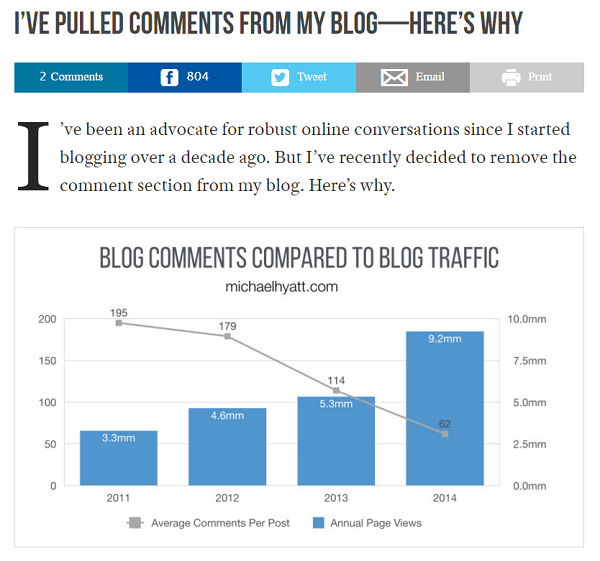 Read “Why We’re Removing Comments on Copyblogger” from March 2014 and “I’ve Pulled Comments from My Blog—Here’s Why” from January 2015 on MichaelHyatt.com. Check out Greg McKeown’s book, Essentialism. Learn more about Stu McLaren. Explore the MarketingSherpa case study on Copyblogger’s email explosion. 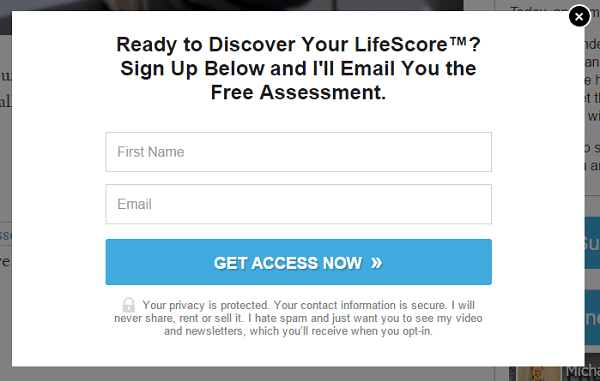 Read about Michael Hyatt’s LifeScore Assessment. What do you think? What are your thoughts on blog comments? Please leave your comments below. 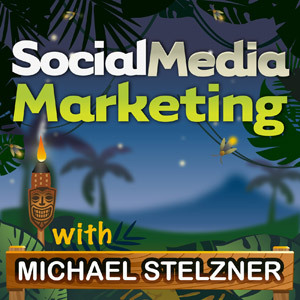 Michael Hyatt and Brian Clark talk with Michael Stelzner about why they turned blog comments off a year ago, and why those comments are now back.